Organizations struggle to quantify the impact engaged employees have on business results. 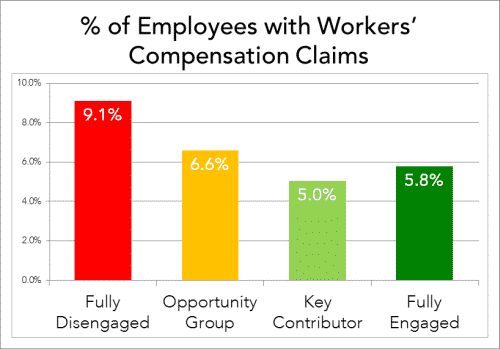 Intuitively, it’s a no-brainer– engaged employees cost less and produce more. It’s that simple. Many studies and reports support that hunch: engaged companies have stronger levels of profitability, and retain their employees. In order to provide good internal comparisons, you will need to look at variance in engagement scores across groups in the organization (think: locations, departments, managers, etc.). This is accomplished by asking demographic questions on the survey or by coding the groupings on the backend (see related post). Don’t bother with comparisons if you can only look at an overall company score. Find out what data is important to your organization. This may include data on profitability, turnover, customer service, or productivity. Make sure you have data that can be compared across groups. Ask yourselves, “What, really, do we want to know? What’s most important for us to understand?” If you’re just about to head into an acquisition, decide on what factors will give you information on what to expect from the people component of that action. If you suddenly have high levels of attrition in a certain department, measure factors that relate to attrition. You get the picture. Remember, a standard, off-the-shelf survey seldom measures all elements most critical to your organization. Many organizations equate overall employee engagement with the aggregate of all questions on a survey. In other words, they take the average score from a question on compensation, meaning, leadership, communication and, say, safety and call it the “employee engagement score.” Dangerous. That’s not employee engagement. Some questions on a survey really don’t even relate to engagement, although they may be nice-to-knows. Don’t measure engagement by using the average score of all survey questions. You also don’t want to measure engagement based on one survey question. Instead, use the aggregate score of five or six anchor questions that only measure engagement. Now that you have measured engagement correctly, and have groups to compare, make sure you analyze external variables that could influence the results. This may not always be possible, as we continually face external factors that could impact engagement. The point is, it’s important to understand these factors. Did one site have layoffs recently? Did the manager of a group change in the past three months? If so, consider these factors when making comparisons. When you effectively prepare your employee engagement survey process on the front-end, rather than after the survey has been conducted, you can make some powerful comparisons to business results that will create buy-in from the executive team and lead to changes in the organization. Do you have any others to add to the list? Share your experiences in the comments.